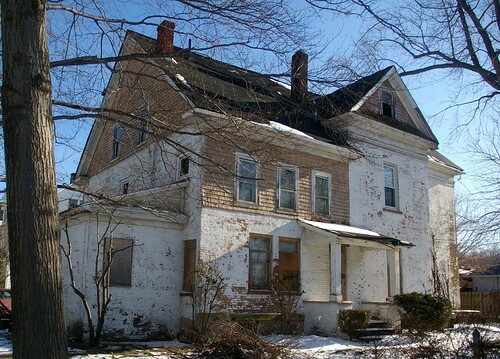 Would you believe that this grand East Cleveland home is still standing!? Fred Welton house painted by daughter Mary. From Ellen Loughry Price, History of East Cleveland, page 21. Recently, I've been doing a fair amount of research into East Cleveland in the 19th century. Part of it is because of a book that I'm doing on the Parks family (builders of this house). More, however, it's because I'm realizing how much interesting history there is in East Cleveland - and how little work has been done to uncover it. Tons of great stories seem to be revealed in the structures still standing, most of them just off Euclid Avenue. Take this pair of houses at 1710 and 1704 Collamer - both moved to this site in the early 20th century. 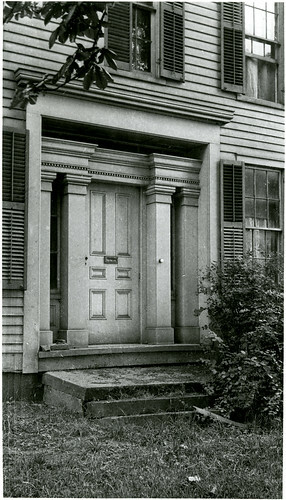 The one on the left (1710 Collamer) has a grand doorway, and appears to have been built in the 1850s. The one on the right (1704 Collamer) is a shorter, post and beam structure, with vertical plank sheathing - something that one usually only sees in much earlier buildings. Both are the subject of continuing research. Why are they so exciting? 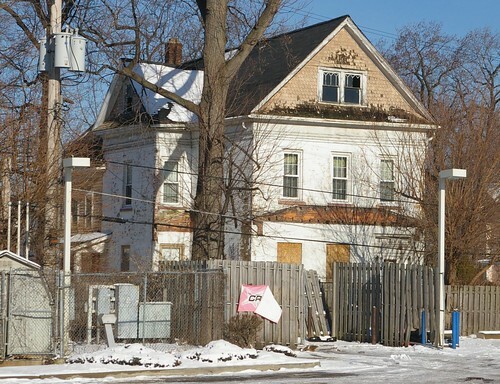 Because they're good-sized structures, likely built on a major road (Euclid Avenue), with considerable historic detail. And nothing has been written about them! (As interesting as the old standards may be, it's always more compelling, for me, to be uncovering something new.) These are but a sample of what awaits. 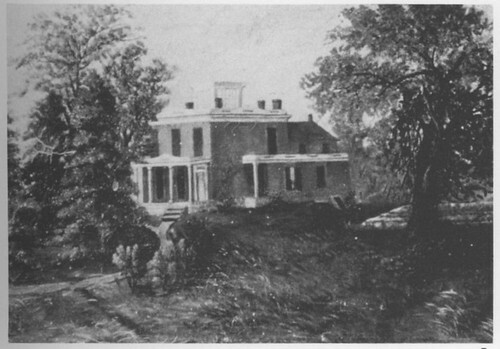 When I first saw Fred Welton house painted by daughter Mary, I was sure that the house was gone - even though Ellen Loughry Price didn't provide any details as to where it might have been located. When I first saw it, on January 25, from an angle similar to this one, it didn't even catch my attention enough to warrant stopping the car. There was something about it that seemed not quite right, but I couldn't put my finger on what that something was - I assumed it was just the odd habits of the builder or architect - or those who had added onto it over time. The roofline, seen here from Euclid Avenue, suggests that the house was built in the 1890s or 1900s - or perhaps the 1910s. But, again, there's something that isn't quite right. 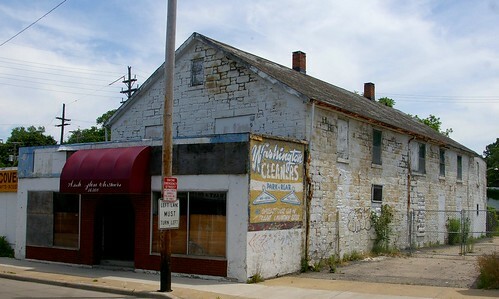 Then I saw this doorway, at what is now the back of the house, facing a gas station and Euclid Avenue. It screams "1850s" (or perhaps a little earlier). The door itself appears original. The spaces between the pairs of columns have small windows (sidelights), which have been painted over. 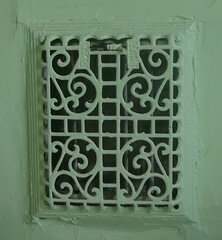 This is also the case for the set of windows over the doorway, the transom. It's quite unusual to see them present, and in this good of condition - I can't think of another extant example of this quality in Cleveland or an inner-ring suburb. Doorway, Mesopotamia, Ohio. 1924. Photograph by I.T. Frary. Print 2142 in the I.T. Frary Audiovisual collection of the Ohio Historical Society. The doorway is of a style common in the better houses of the period - it's quite similar to this one, in Mesopotamia, Ohio - though I think the one on our subject house is slightly better proportioned to the structure as a whole. I took a few more photographs, with the intent of seeing what more I could learn. 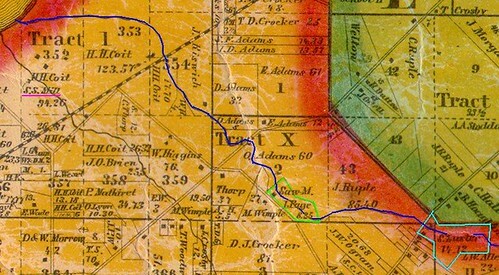 It was only once I was back at the computer, and I found the name of the property owner on a historic map, that I made the connection with the painting above. 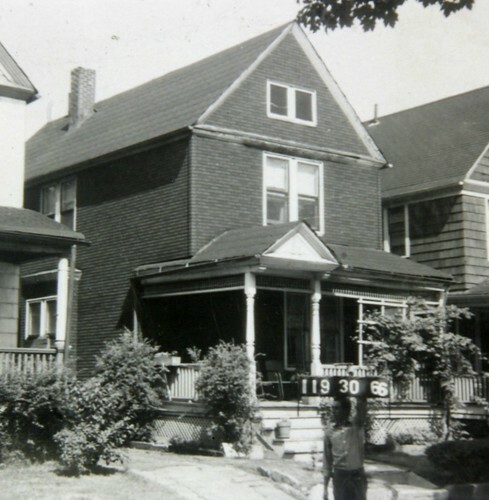 The house was built on the north corner of Euclid Avenue and Shaw Avenue, in East Cleveland, Ohio. 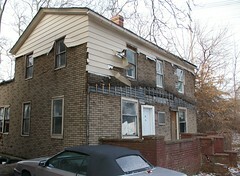 The current address is 15314 Welton Drive, East Cleveland, Ohio. When was this house built, and by whom? Lasell Birge, a farmer, purchased the land that the house would be built on at auction, for $5,0000, in 1851 (Cuyahoga County Recorder, AFN: 185105220001). 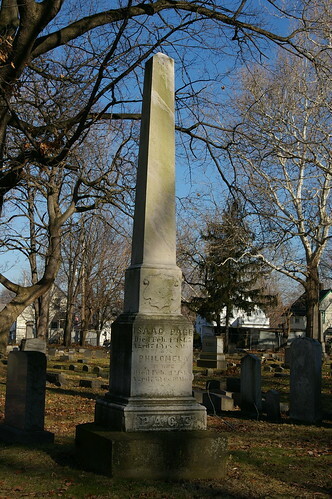 It was being sold by the estate of John Shaw, for whom Shaw High School is named. I haven't been able to learn much of anything about Birge. He was born in Connecticut in about 1811 and married Rebecca Birge, a Vermonter (born about 1820), before moving to Ohio, in or before 1839, the year of the birth of their first child, Cornelius. He may have been living in Palmyra, Ohio, in 1840. Their other children included Eliza (born about 1847); Catherine (born about 1850); and Elizabeth (born about 1855) (1840-1870 U.S. Census). 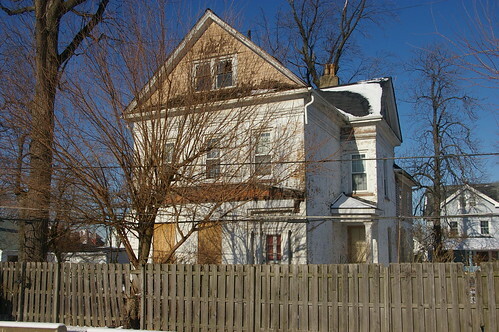 By 1850, the family was living in East Cleveland. They show up there in the 1860 US Census as well, where they're listed as having real estate worth $10,000. He seems to have been relatively well off, as, just two years later, he was able to purchase another significant parcel, on Euclid Avenue, near what is now East 105th Street, with one John Welch, for $3,500 (Cuyahoga County Recorder, AFN: 185304050004). 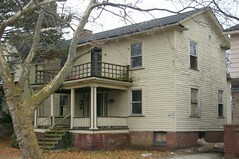 It seems most likely that Lasell Birge built the house by 1860. It's almost certain that it was present by 1864, when he sold the property to Frederick J. Welton (or Wilton). 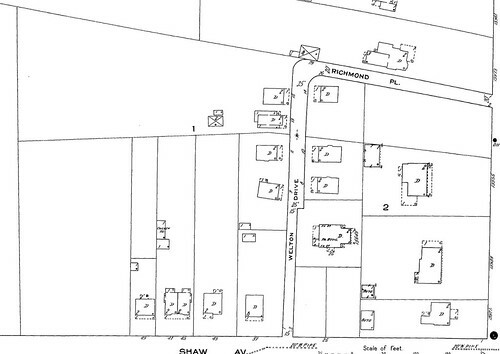 The property, then down to just 5 acres, was sold for a sum of $4200 (Cuyahoga County Recorder, AFN: 186412190004). If we're to accept another property transfer from Birge to Welton, earlier in the year, of a nearby parcel, as representative of the value of the land in that vicinity, the house was worth about $3,750. (The parcel, ten acres, sold for $875 - $87.50 / acre (Cuyahoga County Recorder, AFN: 186408290007)). Frederick Wilton, a farmer, was born about 1799 in Connecticut. 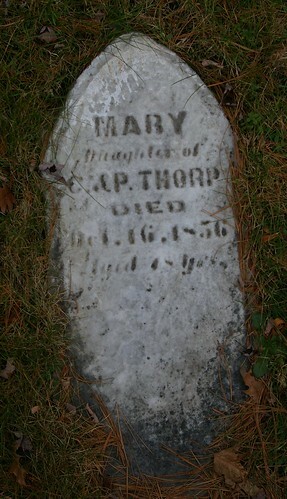 He would have been about 65 when he purchased the house with his wife, Minerva, born about 1818, in Vermont. As of 1870, they had four children living with them in this house: Mary (born about 1845); Frank (born about 1850); James (born about 1850); and Sarah, born about 1856 (1870 U.S. Census). Little else has been written about Welton. A death notice (Cleveland Plain Dealer, February 29, 1872, page 3) describes him as a "well known citizen" and continues, noting that he "died at his residence at Collamer this morning after a short illness. Mr. Welton has resided at Collamer about 15 years, coming from Burton, Geauga County. He has always been a liberal man, a kind friend and a good neighbor. 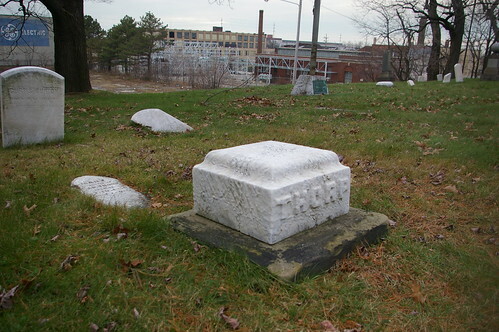 Mr. Welton was born in Connecticut and emigrated to Geauga County in the year 1832." 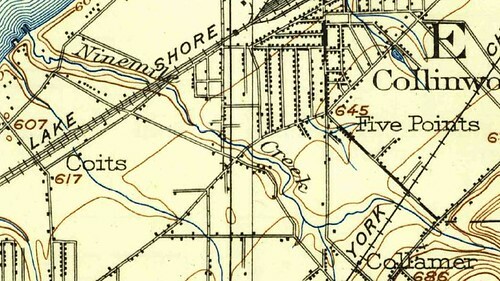 Detail of a plate from the 1898 Flynn Atlas of the suburbs of Cleveland, Ohio. Used courtesy of Cleveland Public Library. 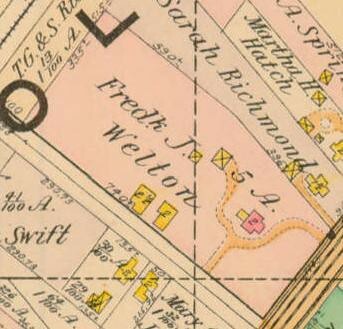 In 1898, the grounds included our subject house, shown here in red, and two other residences, immediately under the word "Welton", facing Shaw Avenue. A driveway provided access to the property, both from Shaw Avenue and From Euclid Avenue, on the right. In addition to a carriage house, there was some sort of other small outbuilding. Detail, 1913 Sanborn fire insurance atlas for Cleveland, Ohio. Volume 8, plate 53. Used courtesy of Cleveland Public Library. Fifteen years later, the same property shows considerable change. (Our subject house is immediately to the right of the word "Wilton" in "Wilton Drive".) Three houses have been built in front of the Birge / Welton house. Richmond Place cuts along the border of the Richmond property, and Wilton Drive runs right behind the house. Several other structures have been built on (or moved to) the five acre parcel. It was by this time that the house acquired the Wilton Drive address. But what of the house as it is today? There are two obvious differences between the historic painting of the house and the structure as it stands today. The roof was replaced, likely due to differences in taste, between about 1890 and 1915. This was not uncommon. The other obvious difference is the porch, now missing. The stone foundation of the porch remains. It's not common to see the entire floor of the porch be stone - more often, you'd just have stone supports for the columns, with the remainder of the floor constructed from wood. This choice of materials is likely the only reason for the floor of the porch to have survived. 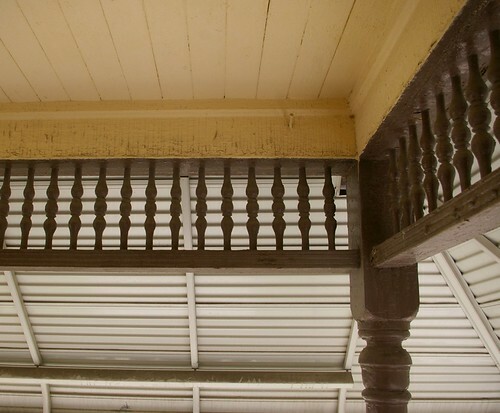 If we look at the outline in the paint where the porch roof attached to the house, the outline of a curved bracket is visible, suggesting something of the style of the columns supporting it. There is much more to be learned in the history of this grand 1850s house - a subject that I hope to deal with in greater depth in future posts. Perhaps you know the owner - or perhaps you know where the painting that I led with is located. I'm still just surprised that a structure with such interesting history was sitting here, right in front of my nose! URGENT! Langston Hughes House is Being "Demolished"
UPDATE (4:00 pm, February 3, 2012) The situation is not completely as I understood it to be - and I apologize for the confusion. The porch is going to be rebuilt - it was removed due to the failure of the foundation. The woodwork is still all being removed, to be replaced with identical - it's an issue of lead abatement - and it is still in the dumpster. There will be an in-depth follow-up on Monday. Langston Hughes, one of the greatest writers of the 20th century, had his first works published while a student at Cleveland's Central High School. At this time (his sophomore and junior years) he lived alone, in the attic of 2266 East 86th Street, in Cleveland's Fairfax neighborhood. 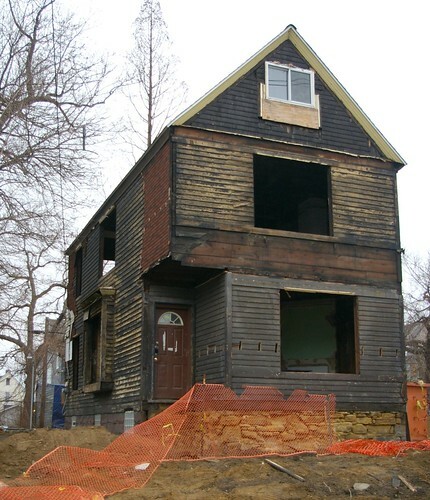 When I learned that the house had been forclosed upon and was sitting vacant, back in 2009, I worked to bring public attention to the structure. These efforts resulted in coverage on National Public Radio's All Things Considered and in the Cleveland Plain Dealer. The structure was made a designated Cleveland Landmark. All these efforts led to Fairfax Renaissance assuming ownership and management of the rehabilitation, with the intent of offering it to a low to moderate income family at a reasonable mortgage - an idea solution. Progress was being made. The plans for the renovation were approved by the Cleveland Landmarks Commission and it looked as though things were proceeding well. Then, yesterday, I drove by the house, and was shocked at what I saw. A look through the window openings this morning confirmed my worst fears: the house had been gutted to the studs, with all traces of the original building material, save for the staircase, gone. Where has it gone? Likely to the two large dumpsters, full to the brim, in the vacant lot next door. Detail of a photograph, used courtesy of the Cuyahoga County Archives. 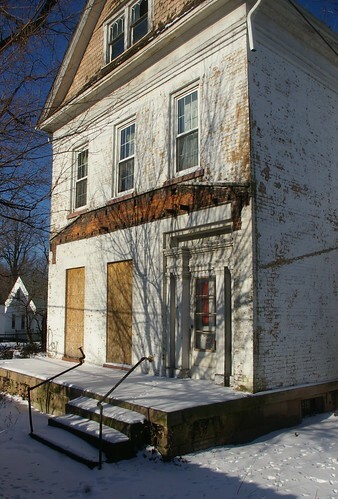 The most obvious loss is the front porch, which was original to the house. 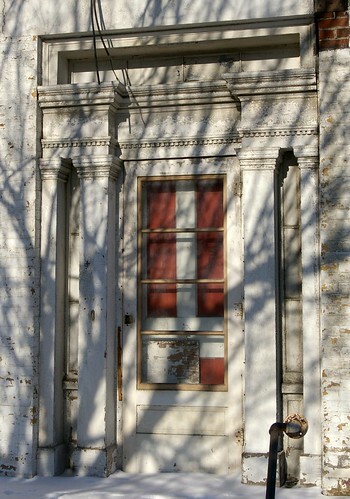 Most of the components of the porch remained, in good condition, when I last photographed the house. It was to be repaired, not removed - and I'm sure that the Landmarks Commission will do whatever is necessary to ensure that it is rebuilt. The staff of the commission will be meeting with Fairfax Renaissance next week to discuss replacement window options, and the porch will be addressed at that time. Of course, it will be much harder to do this if the lumber that made up the porch is in the aforementioned dumpsters, which I fear will be emptied soon. Unfortunately, the jurisdiction of the Landmarks Commission is limited to the exterior. 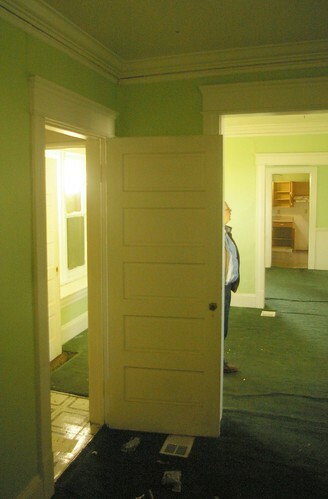 Original doors, crown moulding, and trim, shown here, have all been removed. 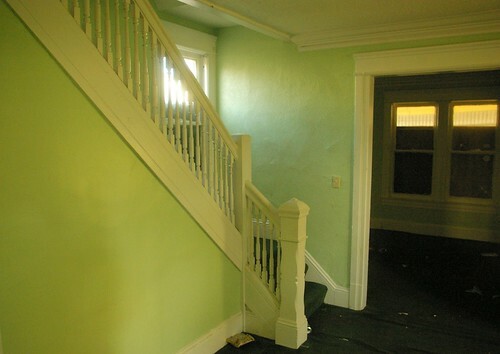 Note how nicely the crown moulding and trim around the doorway complements the stairs - the only remaining bit of original woodwork - and imagine what pictures might have hung from the integral picture rail. 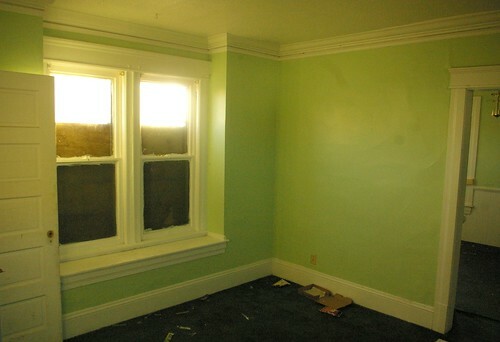 The trim and the doors here, too, are gone. 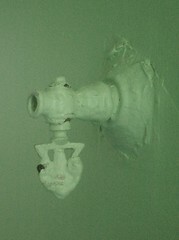 And then there are the little things, the furnace hot air vent and the remains of an old, disused gas light fixture - these are the details make a house unique. My primary concern - is that the fabric that makes this house special will be lost, and most likely soon - as the dumpsters look due to be emptied. How much use do the barely accessible spaces in your attic get? Very little, most likely. They seem, to me, the perfect place to store historic building materials until their importance can be realized. Got some free time this weekend? Consider visiting the site. Ask the construction workers present for permission to remove some of this significant historic material from the dumpsters. With their permission, take it home. Make note that it came from this house, so that you or someone else will be able to return it here when more sensible minds prevail.